Encik Aidan Hamidon was appointed to the Board of EPMB on 28 August 2012. He graduated from the University of Melbourne in 2004 with a Bachelor of Commerce Degree majoring in Actuarial Studies. Encik Aidan brings a combination of experience from the Australian banking industry as well as the Malaysian property industry to the Group. Encik Aidan started his career in National Australia Bank having exposure ranging from market settlements, asset management, and performance and risk reporting. Major clients serviced included active fund managers, institutional superannuation and Australian state government funds. 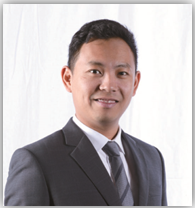 Encik Aidan also has 5 years of experience in the Malaysian property development industry, with exposure to financing, product development, market & sales strategies and overall strategic direction. Since joining EPMB, Encik Aidan has played key roles in the strategic outlook of the Group and developing the Group's business, along with exposures to operations, business development, project management and group financing. He also sits on the board of Nadayu Properties Berhad. His parents, Hamidon bin Abdullah and Dr Linden Hamidon and brother, Johan bin Hamidon are also Directors and major shareholder of the Company.